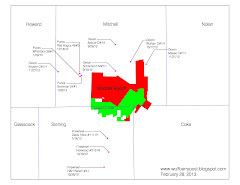 Diamondback Energy purchased 12,500 net acres in Midland County for $440 million (click here). This equals $35,200/acre. Applying these metrics to Lynden Energy Corp.'s Wolfberry project translate to $228 million (6,482 net acres x $35,200/acre). Conservatively, Lynden's Mitchell Ranch could be valued at $68 million (34,150 net acres x $2,000/acre). With 145 million shares, LVL could be valued over $2.00/acre using the above metrics! Lynden reports 1,244 boed during last 14 days!